Frank Vignola (lead guitar); Vinny Raniolo (rhythm guitar); Mark Egan (bass 1, 2, 4, 8, 9); Julien Labro (accordion); Zach Brock (violin); Cassie Holden (bass 3, 10, 11); Matt Wington (bass 6). 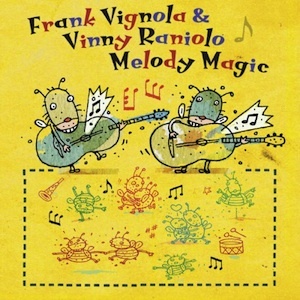 Frank Vignola & Vinny Raniolo have released a fun and incredibly entertaining effort in Melody Magic. While similar recording can die a slow self inflicted death by self indulgence and the more the noticeable lack of artistic proficiency, Melody Magic runs through a rich musical history from J.S. Bach to Sting yet somehow manage to keep an ebb and flow that captures the essence of each tune without reharming an iconic piece beyond the point of recognition. Flavor? Melody Magic is loaded with flavor and texture and the wonderful ability to transform ‘popular’ classical pieces into contemporary riffs occasionally utilizing a Spanish or gypsy influence as exhibited in the opening tune being their spin of Beethoven’s Fifth. Tommy Emmanuel handles the arrangement of the Lennon/McCartney classics ‘If I Fell/Here There and Everywhere’ which actually play quite well given the bands obvious eclectic wheelhouse. ‘Eye of the Tiger’ from Survivor and Sting’s ‘Walking On The Moon’ are at opposite ends of the popular music spectrum yet Vignola and Raniolo manage to transform ‘Eye of the Tiger’ into something more of a gypsy jazz version kicked up a million notches while showing off their instrumental prowess. The Police version of ‘Walking On The Moon’ is magically transformed into a neo-reggae acoustic duet. Some very special guests make their way throughout Melody Magic including bassist Mark Egan, accordion virtuoso Julien Labro, violin phenom Zach Brock and Cassidy Holden and Mat Wigdon on double bass and bass respectively. Frank Vignola became one of the hot tickets in jazz back in 1988 with his famed Hot Club of France tribute and this influence still plays an huge factor in the successful transformation of more popular music into the gypsy jazz idiom without as much as a slight hiccup on the way. Incredibly inventive, entertaining and a release that is sure to make you hit repeat more than once. Utilizing an all-stringed instrument presentation plus Julien Labro’s fine accordion on selected cuts, Vignola and Raniolo, provide an illusion of a joyous string orchestra. The players’ abilities to drive the rhythmic, percussive and harmonic base is most admirable. But, it’s certainly the spirit and savvy arranging of Vignola and the superb playing by all that makes this CD a winner. Melody Magic demonstrates that innovative approaches to classic art can yield both refreshed perspectives and a memorable trip up to Olympus. –All About Jazz.